WILLIAMSPORT, Pa. – A trio of third-quarter touchdowns helped the Lycoming College football team break open an 11-point halftime score, as Lycoming held on for a 35-17 win over Misericordia University on Saturday, Oct. 28, at David Person Field to move into a tie for fourth in the Middle Atlantic Conference with two regular-season games remaining. The Warriors (4-4 overall, 4-3 MAC) scored the middle 35 points in the contest after Misericordia (1-7 overall, 1-6 MAC) opened the game with a field goal and ended it with a pair of fourth-quarter scores. In the third quarter, the Warriors got started after an interception from senior Mike Ward (Edgewater, Md./South River) was returned 41 yards to the 21, where senior Collin Wright (Secane, Pa./Ridley), who made his first career start, found junior Brock Zollicoffer (Owings Mills, Md./Owings Mills) over the middle for a touchdown with 8:41 remaining. After a Misericordia 3-and-out, the Warriors drove 70 yards on seven plays, with senior Sam Dressler (Riverside, Pa./Danville), who found a hole, beat the last defender and ran in from 36 yards out to make it 28-3 with 3:56 left. The Cougars got two first downs on their next drive, but were forced to punt and a 29-yard return from sophomore Dante Gipson (Bordentown, N.J./Bordentown) got the ball to midfield. On the first play of the ensuing drive, Wright went deep and found junior Nick Costello (Havertown, Pa./Haverford), who was just tripped up before finding the end zone. Wright snuck it in on the next play to make it 35-3. Midway through the fourth quarter, the Cougars scored on a nine-play, 61-yard drive and a muffed punt snap led to a 20-yard fumble recovery for a score by Thomas Anderson to get the Cougars within 35-17 with 2:41 left. The Warriors’ junior Mike Mulvihill (Tabernacle, N.J./Seneca) smothered the resulting on-side kick, though, and Lycoming ran out the clock from there. Gipson scored two first-half touchdowns, finishing with nine carries for 52 yards and a score and three catches for 18 yards and a score. He also added 63 yards on punt returns and 33 on kick returns to finish with 166 all-purpose yards in the game. Dressler ran it 15 times for 88 yards and a score and Costello had four catches for 76 yards. Wright finished 12-of-19 for 152 yards and two touchdowns. 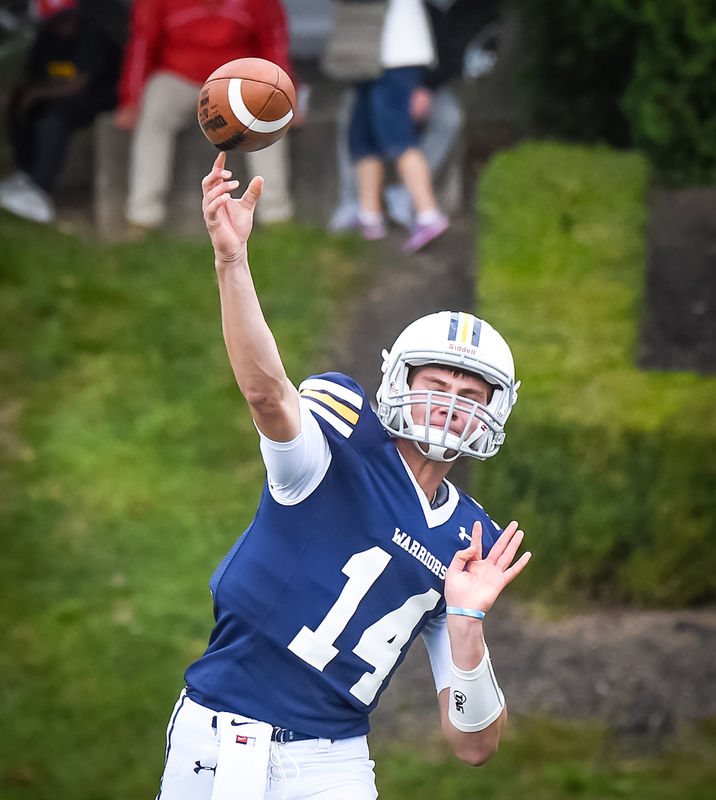 The Lycoming defense allowed just 268 yards of total offense, forcing the Cougars into seven punts and turnover during their 10 drives. Junior Joe Pinzka (Perkasie, Pa./Lansdale Catholic) led the team with nine tackles and Ward added eight stops and a pick. Junior Jarrell Payne (Jersey City, N.J./Liberty) added six tackles, one for a loss and senior Cody Stemrich (Sweet Valley, Pa./Wyoming Seminary) added five tackles, 1.5 for loss. After Misericordia got on the board with a 40-yard field goal from Ryan Davis on its second drive of the game, the Warriors responded with a 10-play, 65-yard drive, leaning heavily on Gipson, who rushed eight times for 35 yards and caught one pass for seven during the drive, scoring on a five-yard scamper. In the second quarter, the Warriors added another score from Gipson from six yards out on a pass from Wright, capping a seven-play, 56-yard drive. The Warriors were able to win the battle of field position all game, despite outgaining the Cougars by just 24 yards, starting their drives at an average of its own 35 as opposed to the Cougars’ 25. Clayton Vleck led the Cougars with 12 carries for 60 yards and score. Aaron Barry was 21-of-33 for 133 yards passing, as he found Isiah Williams 10 times for 56 yards. Damian Diaz led the Cougars with six tackles and Anderson finished with five stops, a tackle for loss and fumble recovery for a touchdown. Before the game, the Warriors honored the team’s 15 seniors in a brief ceremony before the team’s final game at David Person Field in 2017. The Warriors get back on the field on Saturday, Nov. 4, when they head to Lebanon Valley for a 1 p.m. kickoff in Middle Atlantic Conference action.